As a Local Area Representative for Go Au Pair, I am constantly trying to improve the cultural childcare experience for my Au Pairs and Host Families. I was approached by an Au Pair in my cluster who wanted a way to connect with other Au Pairs and learn more about the American culture. I approached Go Au Pair about this and after months of preparation, we released the Au Pair Sis program. This is an interactive online community that offers support and guidance during the Au Pairs stay in America and beyond. I was fortunate enough to be selected as the Au Pair Sis! Each week, I post blogs and videos about Cultural Differences, recipes, crafts, games and we even have a book club and a weekly Ask Au Pair Sis; where Au Pairs can ask questions to other LARs and headquarters. 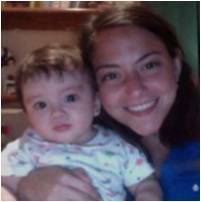 Learn more about the Au Pair Sis program here http://www.goaupair.com/meet-au-pair-sis.aspx. If you want to check out our interactive online community, we are on Facebook: www.facebook.com/goaupair, Twitter: https://twitter.com/GoAuPair and Pinterest: http://pinterest.com/goaupair/. It has been so much fun working with a company that actually cares! I look forward to connecting with you in our online community! How has Rui been described by references? 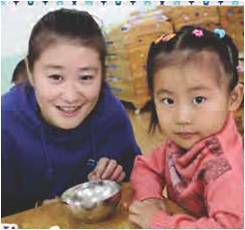 Summer is a kind and patient girl who loves to play with children. Why does Rui want to be an Au Pair? It is a great chance to learn more about Western culture and learn a different language. Want to bring culture into your home and teach your family about another country? Welcome an Au Pair into your home! For a weekly stipened of less then $200 a week for 45 hrs of childcare, you can have live-in childcare on YOUR schedule. Au Pairs are seeking families across America so they can provide childcare and learn about our culture. In return, they will teach your family about their culture and offer you childcare as a member of your family. Learn about our transparent pricing and payment plans! I am a Local Area Representative for Go Au Pair. If you are interested in a cultural care experience for your family click here: http://www.goaupair.com/Northern-New-Jersey.aspx or feel free to contact me, Janine 609-642-2642. This month, Go Au Pair‘s featured country is Panama. Check out one of Panama’s attractions, The Church of San Jose. One of the things you might want to see when you visit Panama is the famous golden altar of the Church of San Jose in Casco Viejo. The Inglesia de San Jose (the Church of San Jose) is a small almost nondescript building on a narrow street in the San Felipe district of Panama City. Inside is the famous Golden Altar, which is made of carved wood and is covered in gold flake. 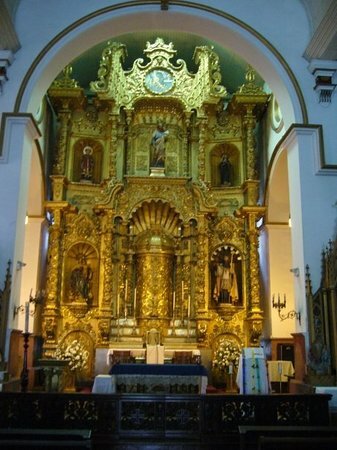 Commonly known in Spanish as the “Altar de Oro” (Golden Altar), it was originally in a church in “Old Panama.” When English pirate Henry Morgan attacked the city the jesuits painted the altar black to hide the gold. The pirates left it alone, thinking it was worthless. After Morgan sacked and burned “Old Panama” the Jesuit monks of the Order of St. Agustine moved the altar to the new church and its present location. One more landmark so you know you’ve got the right place. This is the bell tower from the Church of San Jose in Casco Viejo, home of the famous golden altar. And here’s what you came to see. This church gets quite a bit of tourist traffic, and they are kind of accustomed to it. But you should tread lightly and show proper respect if there is a mass being celebrated when you happen to drop in. It’s fine to take pictures of the altar, but not during a church service. I’ve seen some blundering tourists pull some bonehead moves in this place. As long as you understand that this is a functioning church and more than just a tourist attraction and show a little respect, then you’ll have no problems at all. And, you’ll find that people are very proud of the church and like to show it off. A detail shot of the Golden Altar of the Church of San Jose in Casco Viejo, Panama City. The altar is actually made out of hand-carved wood, and then covered in gold flake. The church is filled with beautiful side altars, also hand-carved wood and enhanced with gold flake. The church also has some very nice stained glass windows, this one dedicated to Saint Rita of Cascia, the Patron Saint of Lost Causes (no kidding). And this one to Saint Augustine of Hippo. These pictures and information have been provided by the Panama Guide. This month, when you welcome an Au Pair with Go Au Pair from Panama into your home, you get $100 off your fees! Au Pair Live-in Childcare is Flexible and Affordable.My name is Janine and I am a Local Area Representative for Go Au Pair. If you are interested in a cultural care experience for your family click here: http://www.goaupair.com/Northern-New-Jersey.aspx or feel free to contact me at AuPairRep [at] gmail DOT com. View available Au Pairs HERE. How has Lacramioara been described by references? She is creative, communicative, open minded, determined, sociable, creative, and self-contained. Why does Lacramioara want to be an Au Pair? I would like to extend with a new host family because I want to learn much more from other family too. I am sure this exploring adventure has a lot of lessons for me. Hobbies: I like music, I like archery, reading and browsing funny videos. I like to go to the cinema and play with children. How has Victoria Patricia been described by references? She is the best nanny you could hire. Why does Victoria Patricia want to be an Au Pair? I would love to spend another year in a different part of the USA, have fun with your children, and grow up in my language skills. Hobbies: Swimming, dancing, listen to music, fitness, drawing, cooking and baking, go walking, badminton. How has Patricia been described by references? She is an honest, reliable, and happy person. She is always friendly and respectful to her fellow man. Why does Patricia want to be an Au Pair? It was always a great dream of mine to live and work in a foreign country and I am really excited that it will come true soon. I would like to go to the United States because I think it is an interesting country with lots of options. I am fascinated by the different cultures of the people and the way of life.